Existing Singlemode cables can now be extended using the TrippLite N455-000-S-PM Duplex Singlemode Fiber Optic Coupler. 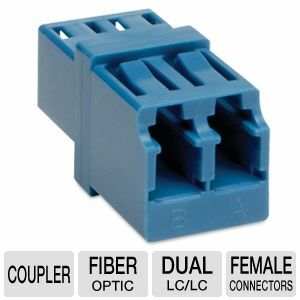 The TrippLite N455-000-S-PM Duplex Singlemode Fiber Optic Coupler provides a convenient way to connect two Singlemode fiber optic cables with LC connectors; it be used with duplex and simplex cable assemblies. The high precision mating design minimizes insertion loss for better transmission of data. Get one now!